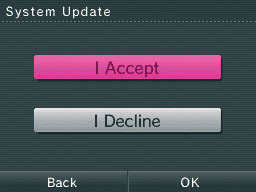 This option allows you to download updates or additions to the Nintendo DSi Menu or built-in software applications. 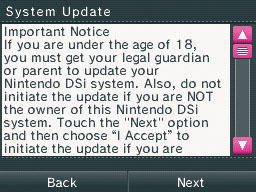 System Updates may be required in order to play new Nintendo DSi games or continue to access the Nintendo DSi Network Service. 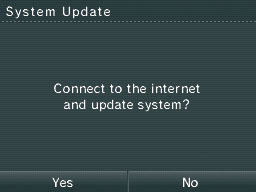 Important: In order to perform a system update, your Nintendo DSi will need an Internet connection. On the System Settings Menu, go to page 4, then select "SYSTEM UPDATE." Select "I AGREE," then "OK" to begin the update.